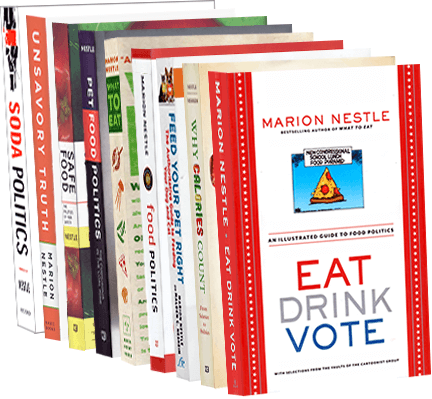 Food Politics by Marion Nestle » FDA’s new food label: much improved! FDA’s new food label: much improved! The FDA is proposing an updated food label today. How’s this for a surprise? I like it! In developing this label, the FDA tested several designs. The public could not understand any of the prototypes, so the FDA picked this one because it was the best of a bad lot (the least worst). If you think it should be easy to revise, consider that its explanation required about 900 pages in the Federal Register of January 6, 1993. Another improvement: updating of portion sizes. The old ones were based on serving sizes reported in the 1970’s and 1980’s. The new label recognizes that portion sizes are much larger than they used to be. The ice cream example: A serving used to be a laughable half cup. Now it’s a cup. The soda example: A serving used to be 8 ounces. Now it’s a more realistic 12—or 20—ounces. Require listing “added sugars.” Yes! For packages that are likely to be eaten at one time, require “dual column” labels to indicate both “per serving” and “per package” information. Require the declaration of potassium and vitamin D. Vitamins A and C can be listed voluntarily. Revise some Daily Values to reflect recent science. Remove “calories from fat” (the kind of fat matters more than the amount). Emphasize calories, serving sizes and Percent Daily Value. The details will come in a Federal Register notice to be released today (see links below). My take? These changes should make the label easier for everyone to understand and use. My preference? I like the Alternate Proposal, and can’t wait to see if anyone else does. The FDA will be collecting comments for 90 days. Weigh in! The food industry certainly will. In the meantime, congratulations to the FDA for a job well done and to Let’s Move! for inspiring the changes and moving them along. Is obesity really leveling off? Yes, and falling in kids ages 2 to 5!